Member of the Nigeria Association of the Blind, Edo State Chapter, Iyamu Joseph (1st left), Secretary of the Association, Lucky Imafidon (2nd left), Chairman of the Association, Nosakhare Asemota (Centre), Edo State Governor, Godwin Obaseki (2nd right) and the commissioner for Women Affairs, Magdalene Ohenhen (1st right) during a courtesy visit at Government House. 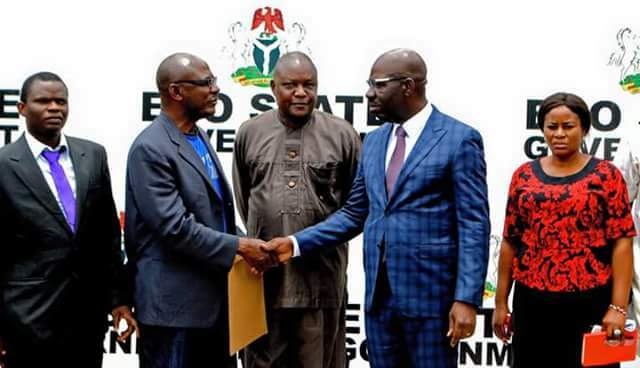 The Governor of Edo State, Mr. Godwin Obaseki, has approved the payment of special bursary for visually impaired students of Edo origin studying in tertiary institutions in the state. Obaseki gave the approval on Monday when the executive members of the state chapter of the Nigeria Association of the Blind (NAB) paid him a courtesy visit at the Government House in Benin City, Edo State. “Persons with disabilities are part of the society and it is obligatory on the part of government to ensure that their welfare is well taken care of,” the Governor said as he urged the association to compile the names of its members who are students in tertiary institutions for onward transmission to the ministry of education to enable them benefit from the scheme. He stressed the need to have an educational system of high standard for persons living with disabilities and promised that a special education department would be established in either the College of Education, Abudu or the Tayo Akpata University of Education, Ekiadolor. Obaseki, however, pledged his administration’s support for people living with disabilities and donated N1 million to the association. He assured that a brail press that would assist persons with visual impairment transcribe normal script to brail, would be established in the state. Chairman of the state chapter of NAB, Mr Nosakhare Asemota, commended the governor Obaseki-led administration for his developmental strides, especially in the education sector. Asemota said that the visit was to solicit the state government’s support in addressing some of the challenges confronting members of the association.